Marianne E. Dambra has more than twenty-five years of experience in early childhood education. She is the president of Early Childhood Education Network of Rochester, Inc., an early childhood education corporation that provides training to caregivers and teachers in the early childhood field in Rochester, New York. She has presented on heat-free cooking with children since 1994, including eight National Association for the Education of Young Children (NAEYC) conferences, twelve New York State Association for the Education of Young Children (NYAEYC) conferences, and numerous regional AEYC conferences. Marianne holds a bachelor's degree in early childhood studies and is pursuing a master's degree in teaching and curriculum. Help children experience the many benefits and joys of cooking—all without entering the kitchen or using the stove or oven. 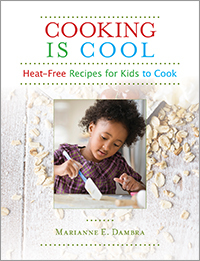 Cooking Is Cool includes more than 50 heat-free, classroom-friendly recipes, each designed so that children can help prepare healthy appetizers and dips, beverages, snacks and treats, and sandwiches and salads as they explore new foods, build math and literacy skills, and learn about nutrition. A food program matrix, safety tips, and photographs are included.